So why women wearing glasses you ask? I wear glasses now and always have. As a child my glasses were very "red," my favorite color at the time. As I got older I had a different color for each outfit and now I buy hand-painted frames from local artists. Glasses have always been my fashion accessory. I own many books written about glasses and they have several things in common. There are photographs of glasses with no one wearing them and there are drawings of people wearing glasses. None of my many books contain photographs of people actually wearing glasses. I wanted to know what real people looked like wearing their glasses from the early 1800s to about 1930. So I started my quest. The first thing I realized was that I had no problem finding photographs of men wearing glasses. They were everywhere. Wearing glasses for men was viewed similarly to that of a man being overweight, it was a sign of prosperity. Far too easy a hunt I reasoned. Where were the women? Women wearing glasses are difficult, but not impossible to find. 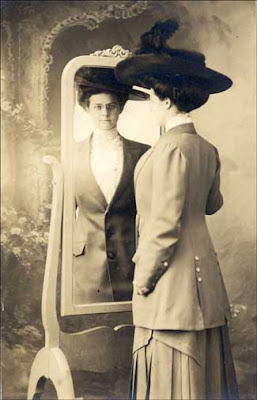 Although glasses have been around for quite some time, women wearing them have not. Glasses, you see, were for elderly women, a product of their age. Young women had one goal in life - to be beautiful so they would make an advantageous marriage and glasses did not enhance their beauty. Men felt there was no beauty in a young women wearing glasses, rather it was a sign that the woman felt herself equal to men. Women were discouraged from wearing glasses and sometimes even forbidden to wear glasses. God forbid a woman was able to see what she was doing. The photographers themselves had a great deal to do with why there were so few photographs of women wearing glasses. Most photographers considered themselves artists in the same sense as old world painters and glasses played no part in their artistic vision. They often asked women to remove their glasses. They complained of the glare from the glasses when taking a photograph. I do find it strange that there was no glare from the glasses men were wearing. I like a challenge, so I decided to collect women wearing glasses. Once the collection grew I knew I had to write a book to show those real women wearing glasses. The collection and the book became one, My Blind Passion. My collection numbers several hundred examples of women wearing glasses. 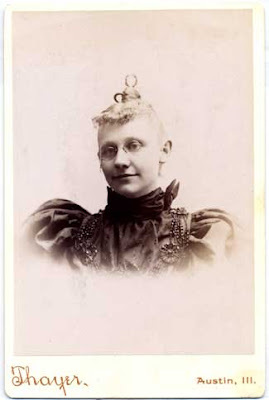 Below is probably the earliest photograph I own of a woman wearing glasses. It is a daguerreotype, of which I have three. The woman looks as if taking her portrait was very painful. Sixth Plate Cased daguerreotype. Author's collection. and lined with red velvet. 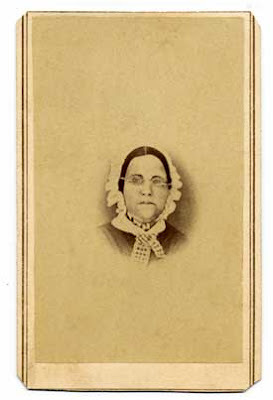 I also have one ambrotype and one tintype of a woman wearing glasses. As I only have one of each I'm sure you won't mind if I save them for the book. The bulk of my collection are Cartes de Visite, Cabinet Cards, and card mounted photographs. The following are examples of the different types of photographs I own. Each of the different types of photographs in the collection are broken down into sub-categories. For example, infants, children, mothers and children, vignette, sitting, standing, communion, graduation, wedding, and occupation to name a few. One of the categories I identify as glamour shots. Attractive women dressed elegantly and brave enough to wear those glasses. Another category is the weird strange and unusual. 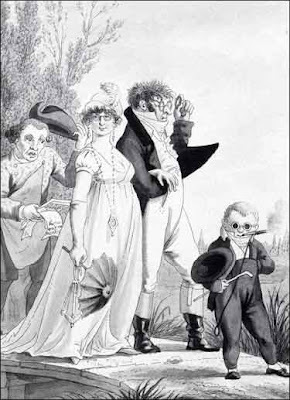 Below the young woman has tied herself to the fashion trends of her time even when they were not flattering and she wears those glasses. One of the more exciting sub-categories of women wearing glasses, actually doesn't involve the wearing. Instead it is photographs of women who are holding their glasses, or who have pinned their glasses to their clothing. 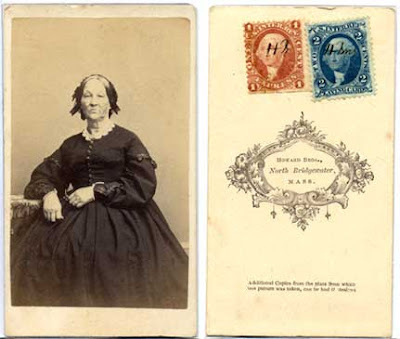 Below is a Carte de Visite of a Civil War era woman holding her glasses in her hand (see inset). 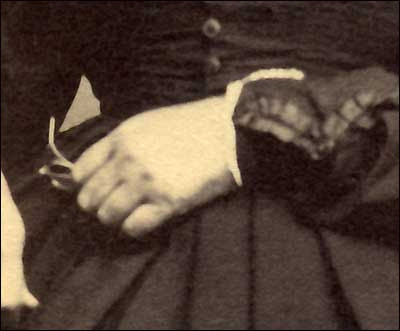 Directly below the inset is a photograph of a woman who has attached her glasses to her clothing. These are very difficult to find. 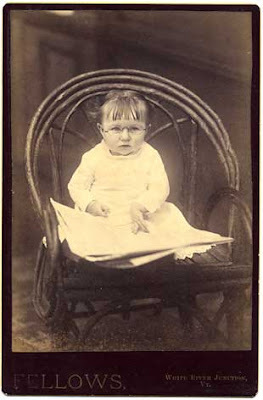 Next is one of my favorite sub-categories, an infant wearing glasses. Just as today we place a baby in a cooking pot, put a chef's hat on their head, hand them some spoons and take their picture, early parents played cute with their infants as well. Our little girl is wearing glasses and reading the newspaper. Infants wearing glasses either for fun or function are difficult to acquire. Equally difficult to find are children wearing glasses. The little girl is wearing pince nez (pinch on the nose glasses) attached with a cord. She poses with an umbrella under her arm and an exceptionally short hairstyle which could indicate illness or hair that just wouldn't grow. Below is a photograph of a nurse wearing glasses. It depicts her wearing the clothing suitable for her particular field. Photographs that reflect job affiliated costumes are called occupational photographs. 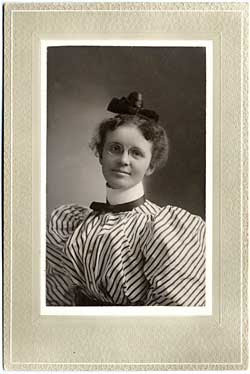 Other occupations where photographs of women wearing glasses can be found are school teacher, nanny, librarian, and nun. I have the school teacher, nanny, and librarian, I'm still searching for the nun. Another sub-category of collecting in women wearing glasses is women holding opera glasses or binoculars. I have very few photographs of this category. The women with opera glasses are usually elegantly dressed; the opera glasses a prop to indicate their level of culture. A bride must have really needed her glasses to have her wedding photograph taken wearing them. I also collect ephemera to compliment my collection of women wearing glasses. 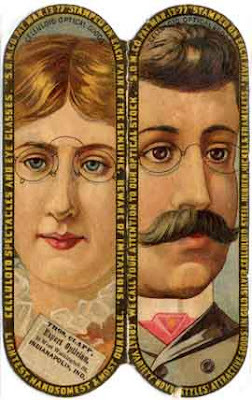 Below are two small, illustrated cards we now call trade cards advertising two opticians. 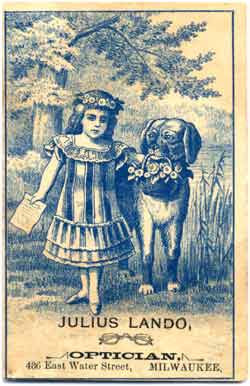 By the 1880s, trade cards had become a major way of advertising America's products and services. 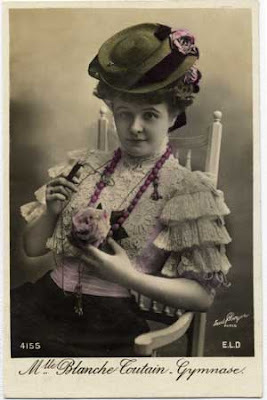 The popularity of trade cards peaked around 1890, and then almost completely faded by the early 1900s when other forms of advertising in color became more cost effective. 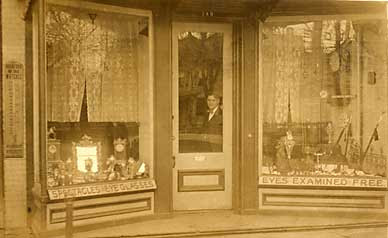 Along with advertising I collect photographs of businesses that sold eyeglasses such as the one below that advertises "Spectacles & Eyeglasses" and "Eyes Examined Free." Often the sales of eyeglasses were combined with jewelers, watchmakers and the sale of silver. Eyeglasses were one of the top items stolen, as they were originally constructed of silver and gold. And now I close with my favorite photograph of a woman wearing glasses. Ochiali, Gli. Eyeware. New York: Chronicle Books, 1987. Winkler, Wolf. A Spectacle of Spectacles.Germany: Eurfurt, 1988. Gentleman Wearing Spectacles. Mayes (Cabinet Card). Unknown. Privately held by the footnoteMaven, [ADDRESS FOR PRIVATE USE,] Preston, Washington. 2008. 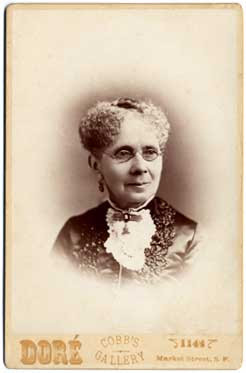 Mature Woman Wearing Spectacles. 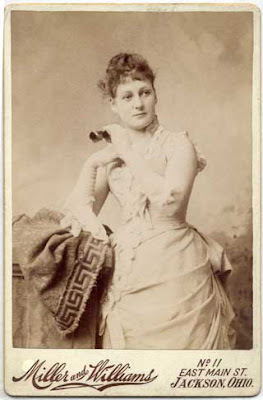 Dore (Cabinet Card). Unknown. Privately held by the footnoteMaven, [ADDRESS FOR PRIVATE USE,] Preston, Washington. 2008. Woman Seated. 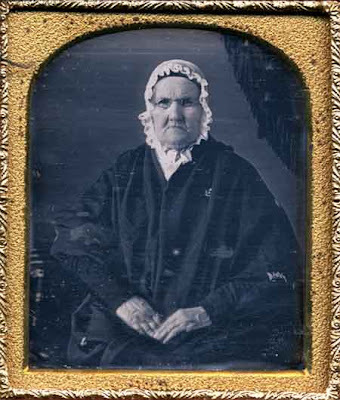 Unknown (Daguerreotype). Unknown. Privately held by the footnoteMaven, [ADDRESS FOR PRIVATE USE,] Preston, Washington. 2008. Woman. O.E. Mitchell (Carte de Visite). 1862. Privately held by the footnoteMaven, [ADDRESS FOR PRIVATE USE,] Preston, Washington. 2008. 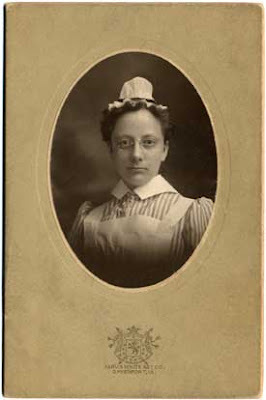 Woman With Spectacles. Allis (Cabinet Card). Unknown. Privately held by the footnoteMaven, [ADDRESS FOR PRIVATE USE,] Preston, Washington. 2008. Woman Pince Nez. Unknown (Card Mounted). 1897. Privately held by the footnoteMaven, [ADDRESS FOR PRIVATE USE,] Preston, Washington. 2008. Woman Lorgnette. Unknown (Postcard). 1904. Privately held by the footnoteMaven, [ADDRESS FOR PRIVATE USE,] Preston, Washington. 2008. Woman & Mirror. Unknown (RPPC). 1914. Privately held by the footnoteMaven, [ADDRESS FOR PRIVATE USE,] Preston, Washington. 2008. Woman Several Photos. Unknown (Photo Booth). 1915. Privately held by the footnoteMaven, [ADDRESS FOR PRIVATE USE,] Preston, Washington. 2008. Elegant Woman. Unknown (Card Mounted). Unknown. Privately held by the footnoteMaven, [ADDRESS FOR PRIVATE USE,] Preston, Washington. 2008. Weird, Strange & Unusual. 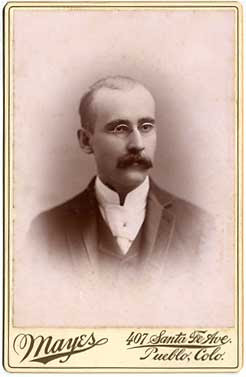 Thayer (Cabinet Card). Unknown. Privately held by the footnoteMaven, [ADDRESS FOR PRIVATE USE,] Preston, Washington. 2008. 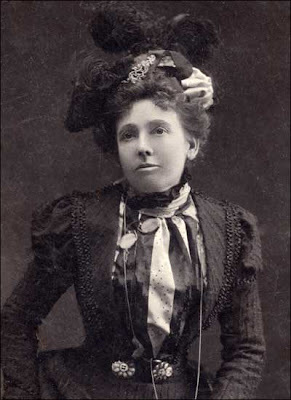 Woman Holding Glasses. Hobson Brothers (Caret de Visite). 1862. Privately held by the footnoteMaven, [ADDRESS FOR PRIVATE USE,] Preston, Washington. 2008. Infant. Fellows (Cabinet Card). Unknown. Privately held by the footnoteMaven, [ADDRESS FOR PRIVATE USE,] Preston, Washington. 2008. Child Wearing Pince Nez. J. C. Steinman (Carte de Visite). Unknown. Privately held by the footnoteMaven, [ADDRESS FOR PRIVATE USE,] Preston, Washington. 2008. Nurse. Jarvis (Card Mounted). Unknown. Privately held by the footnoteMaven, [ADDRESS FOR PRIVATE USE,] Preston, Washington. 2008. Woman With Opera Glasses. 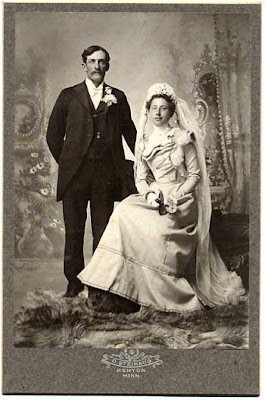 Miller & Willias (Cabinet Card). Unknown. Privately held by the footnoteMaven, [ADDRESS FOR PRIVATE USE,] Preston, Washington. 2008. Wedding. Steihaug (Card Mounted). Unknown. Privately held by the footnoteMaven, [ADDRESS FOR PRIVATE USE,] Preston, Washington. 2008.
Business. Unknown(Postcard). 1904. Privately held by the footnoteMaven, [ADDRESS FOR PRIVATE USE,] Preston, Washington. 2008. Have you finally revealed yourself to us? Love the pictures! As always!! But something is missing (the picture of Linda is sans glasses). So where is the one of you wearing glasses? I only wear glasses when I read. Today's are very reminiscent of my high school volleyball coach. 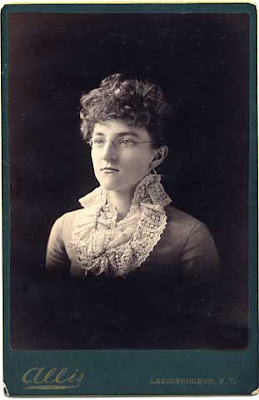 It is hard to decide which photograph is my favorite but I do rather like the Thayer cabinet card lady with the hairstyle that looks like a monocle perched on top of her head! 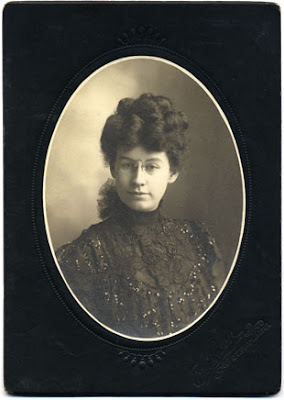 I am saving my favorite eyeglass-wearing lady for a future carnival (probably Smile For the Camera) - my great great Aunt Lizzie. 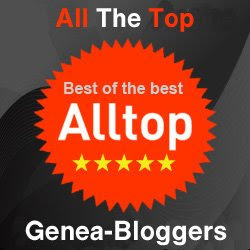 The wearers of tinted eyeglasses would fit in perfectly with the blog title, BTW. Looking forward to Lizzie online. I have saved some of the most rare photographs for the book. I have only three with tinted glasses. One actual photograph with a lorgnette, and three with glasses in their cases on chains around the neck. Fingers crossed - a book! What an excellent story you spin and what a lovely set of photographs of ladies with and without glasses. I am so happy that you talked the footnoteMaven into letting you write today's guest column. The two of you compliment each other so very much. I am delighted to learn of your book about ladies wearing spectacles --- I'm sure it will be most well received. Thanks for reviewing it for us here at SHADES. Thanks, MAVEN, for another excellent writer and guest --- this is the best one yet in my opinion. How very nice to finally meet you. I've heard so much about you from footnoteMaven! Thanks for sharing. And I adore your collection (as a woman who wears glasses...but I take mine OFF to read). And let me just say that any friend of the footnoteMaven is a friend of mine. Your photographs reminded me of a book from my childhood in which a young woman (of your early twentieth century time frame) wore eyeglasses. 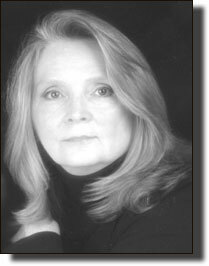 It took me some time to remember and track her down - Carney Sibley of the Betsy-Tacy series. As I recall, "Carney's House Party" had several illustrations of Carney wearing her spectacles. She was special because she wore glasses (as did I) and as I recall none of my other fictional friends did. Thanks for bringing her back. Bravo! Bravo! Wonderful photos, wonderful story, wonderful author! Your passion comes through loud and clear. How I'd love to see some of those artist-painted frames you speak of. I wear glasses (since 8th grade) but not just for reading. Shopping for new frames is as excruciating a chore for me as shopping for jeans or a swimsuit. The problem is I just don't like myself in glasses! The next time I have to shop for frames I'll come back and review your article and maybe just maybe I'll be more inspired. Linda! Love the photos. I can't wait to see the entire collection! I love the children! Thanks for sharing this with us, it's been a wonderful read. I'm now trying to think of ancestors and photos in which somebody is wearing glasses and I can only think of my Aunty Edna. 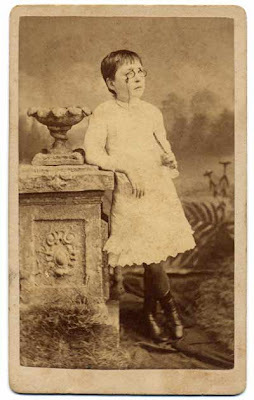 One photo of her as a child showed reflection in her glasses and the photographer had made a comment on the back of the photo. At last, the "back story" and a wonderful one it is! Thanks so very much for opening the door and sharing it with us, Linda/fM. Your collection makes us "four-eyes" feel like we have a true heritage. Let the word out if you want to expand to the mid 20th century -- there are some real winners in my scrapbooks. Just saw this article! What a wonderful article! Can't wait for more! Thought I saw a pix a few weeks ago of Linda, but wasn't sure it was here! Hope everything is progressing nicely for a wonderful writer and genealogist! 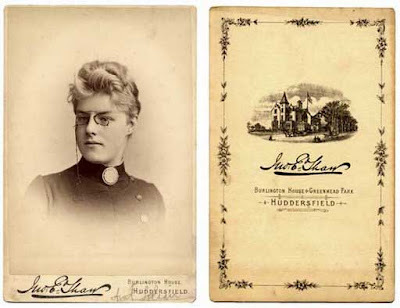 Some great photos of women wearing a pince-nez. Contrary to popular belief, a perfectly fitted pince-nez stayed securely and very comfortably attached to the bridge of the nose at all times. 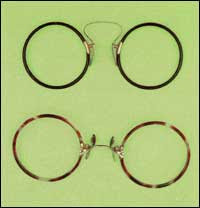 Pince-nez in that era were referred to most often as eyeglasses. Spectacles had arms or temples. Eyeglasses and Spectacles were unisex until the late 1930's. Brilliant Article and Brilliant collection! I love the photograph! Thank you so much.